Livy's Ab Urbe Condita, translated into French by Pierre Bersuire. Manuscript written by Maître Jeannin de Rouen, in a stunning binding 'à la Fanfare', c. 1580. 450 x 318 mm. – 375 leaves. With 87 large miniatures. The great Roman historian Titus Livius (d. 17 AD) wrote his Ab Urbe Condita in 142 books, divided into ‘decades’ of ten books each. During the Middle Ages only decades I and III-IV were known. Jean le Bon, king of France (1350-1364) commissioned a French translation of all of Livy that was known at that time from Pierre Bersuire, friend of Petrarch. It was the first translation of any major classical author into French (1358). With 87 splendid miniatures this is one of the most richly illustrated of all known copies of Livy. 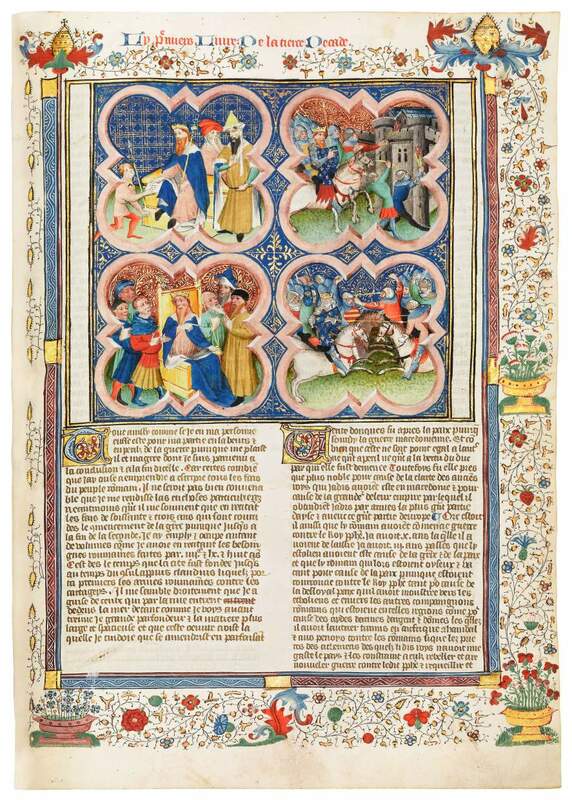 The standard cycle of illustrations for manuscripts of Les décades had 30 pictures altogether (one for each book), arranged as frontispieces of four images at each of the three decades, with 26 smaller miniatures throughout the text. This was the norm, even for the grandest royal copies. Some have fewer pictures, or none at all. In the present manuscript, however, many chapters have illustrations within each book. Even though some of the quires have been damaged by moisture, this is a most impressive, large format book with most delightful illustrations painted in a stunning palette of well-preserved colours. This codex offers everything that the Middle Ages are supposed to be: battles, jousts, knights, armour, castles, trumpeters, kings, maidens, banquets and so on – in a profusion of colour and chivalric splendour. Also on that last page, a remarkably detailed account of the transmission of the text is added. It tells that King Jean originally had the book translated. He gave it (or a copy, at least) to his daughter, Marie, Duchesse de Bar (1344-1404), and she presented it to her son, Edouard, Duc de Bar, who was killed at Agincourt in 1415, and so it was passed to his brother instead, Cardinal Louis de Bar, who died in 1431, naming his heir as King René of Anjou (1409-80). When René went to Italy in 1438 to claim the kingdom of Sicily, he entrusted the manuscript to Robert de Baudricourt (c. 1400-1454), protector of Joan of Arc, bailli of Chaumont (in the duchy of Bar), who lent it to Jean de Vy, eschevin, son of Jean de Vy, chevalier, who had it copied. This detailed provenance of the royal copy is known only from the present inscription. If the manuscript was indeed transcribed directly from an exemplar from the royal library, it is likely to be of exceptional purity. The text was checked gathering by gathering, for the words “correct[us] est” are added at the end of quires 1-3 and 24 (the latter in red ink).